What does Airbnb have and what does it lack to revolutionise hotel distribution? HomeBlogWhat does Airbnb have and what does it lack to revolutionise hotel distribution? The media has carried out a widespread diffusion of the story that Airbnb is now offering hotels. The size of this giant company and its potential are well worth the fanfare. Although it has already stated its low commissions, little has been written about the ticking time bomb for distribution which is the different system of costs and prices, which mixes the agency and the merchant models, adding unique characteristics to them. Charges commission to the hotel: 3% (5% on strict cancellation rates). It specifies it does not charge commission on included taxes so that, in order to compare it with the OTAs who do charge it, they must reduce their commission to the same proportion as the percentage those taxes amount to. It sounds attractive… if it was a pure agency model such as Booking.com or Expedia. It transmits the price, as it is, from the hotel to the user. For example, if the hotel charges $272, the client sees $272 . It charges the client and pays the hotel afterwards. It adds a markup: Between 5 and 15%. It calls it a “Service fee” but the concept is very similar: an extra amount that the intermediary adds and keeps it entirely. The hotel does not know nor has control over the final price. It is Airbnb who decides the amount of this Service fee. It is transparent with the client in regards to its Service fee. Unlike a traditional markup, its Service fee clearly appears broken down and separate from the hotel price. The concept is a novelty: The hotel has a price and the Airbnb service another. Both charged to the client. Is this open to all hotels? Hotels with specific characteristics are invited to join: Boutique hotels, B&Bs and, generally, unique accommodation with a personalised service which is close to its clients. This leaves the door open to a large percentage of hotels, precisely those that, due to their reduced size, are more exposed to commercial powerlessness. The hotel must request its participation to the connectivity partner (for example Siteminder) and it must be approved by Airbnb. Size and potential: Current distribution is a thing of giants. Only another giant could change it. It grows by 40% interannually and its brand value is not just high, but instead moves up places at great speed. It does not require a contract, something which allows the incorporation of thousands of establishments en masse without requiring a commercial network and slow individual contracts. All it needs is connectivity with platforms, such as the one it has just carried out with Siteminder. Low commission for the hotel, which places it in a position of asking for a reduced price. It is the same principle that we defend at Mirai: low-cost channels deserve a preferential price, as is the case with the direct sales. Both Airbnb clients and direct ones have the right to not pay for costs of services they have not incurred. The final invoice should reflect this. Service fee: A groundbreaking model in the industry in which the client is responsible for all the costs generated according to the chosen channel. Currently, with the parity rule, all clients from all channels are obliged to pay for the benefits that only a few enjoy. During its years of existence, Airbnb has not had any problems justifying the cost it charges its clients with. Despite this alleged obstacle, it enjoys a better brand image than OTAs. OTAs often boast about innovation and the investments they make by offering their excellent customer service. Nobody disputes how positive their contribution is. However, they have never passed the definitive test: achieving for the client to happily pay for an extra fee for the added value he receives. The industry withstands high distribution costs, currently transmitted to all clients evenly. OTAs enforce this due to parity clauses. A transparent distribution cost paid by the client depending on the channel he chooses is the first step to establish competencies to reduce the costs and, therefore, the final invoice. Airbnb has this model and this is a potential bombshell. More complete management functions. Hotels require more tools than the houses, apartments and rooms that Airbnb is used to dealing with. They have promised to add them during this year. For a monster of Airbnb’s potential, this technological adaptation should be a piece of cake. We are talking about net prices, or semi-net prices, not comparable to the retail price distributed by other channels. How can any OTA demand parity by claiming a final price on Airbnb which doesn’t depend on the hotel and which corresponds to another model? If a distributor wants the same conditions as Airbnb, it must apply the Airbnb model. It does not have discount programmes paid by the hotel. Cutting their Service fee. The fee ranges between 5 and 15%. Sorry Airbnb, a 24/7 customer service is almost a must for all hotels, not a differential value. It does not justify that 15% extra cost by any stretch of the imagination. Airbnb is a long way away from competing in terms of customer service with the main OTAs, who have a big advantage over them. Applying this markup automatically leaves you outside the market. 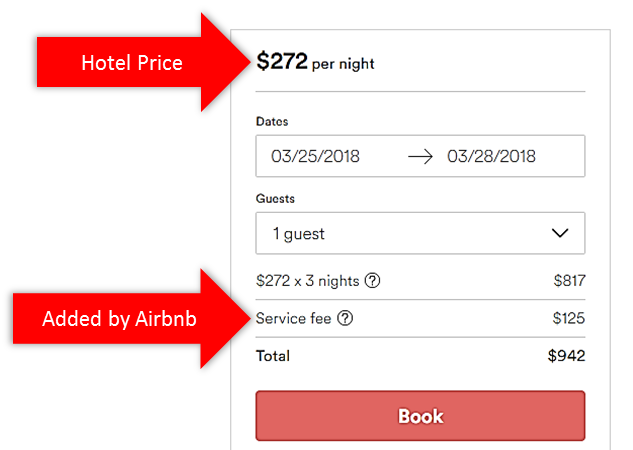 Airbnb charging less implies an immediate consequence: lower marketing investment capacity: less advertising, forgoing expensive affiliates, non-presence on metasearch engines, etc. … but perhaps it may be positive. The new dream distribution model, at a lower cost, inevitably means reducing the exaggerated levels which hotel marketing has reached. Those affected will be the marketing intermediaries (Google and Metasearch): On one hand they would see their multimillion dollar income received from providers reduced and, on the other, a chaotic situation in prices could restore their value of final-price comparers. Perhaps they should, like Airbnb, look at the user to charge him? Then, the question inevitably emerges: Without the visibility of online marketing, could Airbnb compete with OTAs? Many start-ups have not managed to do it. Airbnb would have to trust their brand power. Their main argument would focus on a better final price. Would that be enough? It’s possible that they won’t achieve it but if anyone can, that’s Airbnb. Groundbreaking determination. Does Airbnb have all this strategy in mind? Unfortunately, we don’t think so. Their presentation documents for hotels do not speak about a reduction in the Service fee, do not request a better price and do not mention their intention to transform the industry. Does it simply expect that transferring their model to hotels, as it is, will work with the same degree of success? If this was the case, I’m afraid it would show naivety and a lack of knowledge. Which price should the hotel offer Airbnb? It cannot be the same one as the one distributed to OTAs, based on the retail price and subject to price parity. It should charge a systematically reduced price. Reduced by how much? A way to estimate it would be with a figure proportional to the lowest commission charged by Airbnb to the hotel in comparison to OTAs. 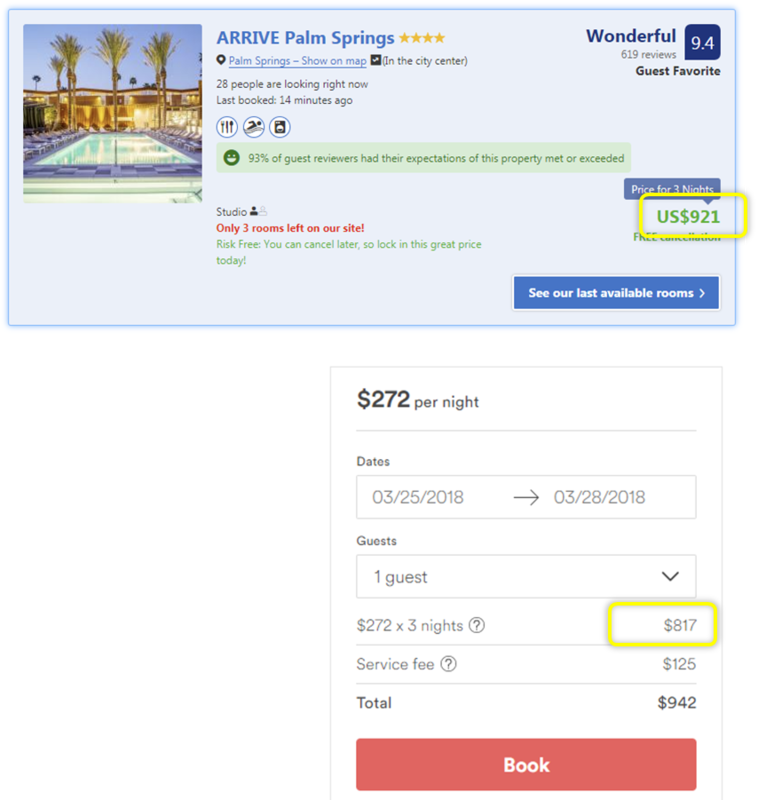 Also, Airbnb does not apply lineal discounts on the hotel price as do Expedia or Booking.com (discounts for packages, Genius…), and so the resulting net ADR for the hotel will not suffer from such erosion… Yet another reason to compensate Airbnb with a reduced price. On the other hand, since you probably want to earn more with Airbnb, apply the lower part of the discount ranges. By reducing this price for Airbnb, the hotel will have fulfilled their end. All that is needed is for Airbnb to also reduce their part of responsibility. The final result depends on the combination of both reductions. For example the hotel from the image below offers a price on Airbnb reduced by 11.3%, which it places on an OTA: Not enough. Since the Service fee is also a complete 15%, the final price remains larger on Airbnb. What would be the final retail price on each channel: OTA, Airbnb and direct sale? Result: The retail price decreases but net income increases. The hotel wins, the client wins. This subject is particularly of interest to us because, in the distribution league, Mirai is a squad player in the direct-sales team. Just like in direct sales, Airbnb has low costs and therefore deserves better price conditions. Even hotels who don’t participate in Airbnb can benefit from the current distribution model based on high commissions and price parity starting to crack. Should hotels who are in a position to do so participate in Airbnb? Yes. They have nothing to lose. It is managed by the Channel Manager and it will not result in any new operations (except for the Airbnb charge). Will Airbnb distribute the hotel in metasearch engines? It would create a competitor in a channel in which the hotel is already present. Will it prevent bidding for the hotel brand in Adwords – another space unnecessarily occupied by intermediaries? It would also drive up both its own costs and those of the other bidders, among them direct sales. Will it offer discounts which go beyond than the price set by the hotel? Is it open to changing its charge system and allow payment at the hotel? Surprisingly, what could put an end to price parity is not state regulations nor the revolt of hoteliers in favour of their direct sales but rather Airbnb itself. It has the potential and the appropriate model to do so. It also opens the door to the sought-after cost reduction, which involves the client being responsible for the charges of the service he chooses and for the hotel losing control over the final price. Is Airbnb aware of its disruptive potential? Does it have any intention to drive towards a new model? Perhaps we should start asking them these questions.